The five Hugo-nominated professional artists are all outstanding, each in his own way, and we are blessed to have artistic talent like theirs in our field. I don't have the expertise to evaluate the artists' relative degrees of craft and technique, but I can say whose work most catches my attention and most rewards repeat examinations, whose cover art makes me want to read the book just so I can carry that gorgeous cover around. The two artists who consistently draw that reaction from me are Stephan Martiniere and John Picacio. As much I love every Martiniere cover, I will have to rank Picacio #1 this year, because 2009 saw some of his most striking work yet. 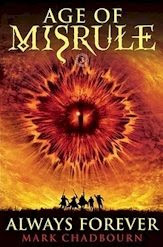 Let me call particular attention to his covers for Mark Chadbourn's Age of Misrule series, from Pyr Books (which never disappoints with its cover art). The covers are beautiful individually, but even more memorable for their progression through the series, from the torso of the immense mythical creature on the cover of World's End (dwarfing our heroes in the foreground) to the head on Darkest Hour to finally the Sauron-esque eye on Always Forever. Amazing stuff! This should take nothing away from the other excellent nominees. 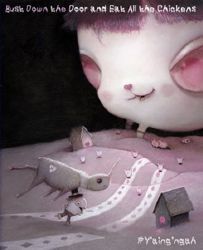 Shaun Tan's Tales from Outer Suburbia is a terrific showcase of his work, even if it suffers a bit by unfair comparison to his wonderful book The Arrival from 2007. I hate to put Bob Eggleton all the way down at #4, as he has been one of the most reliable artists in the field for many years, but then again he already has nine Hugo Awards to show for that body of work. Daniel Dos Santos is also very good, although his style is slightly less to my tastes than the other nominees. Suffice to say that whoever wins the award will be a very worthy recipient. This week's story recommendation is for Rachel Swirsky's Tipping the Velvet, from literary zine Pank. Most folks who see a Toulouse-Lautrec poster of 19th Century Parisian women doing the can-can have one of two reactions: (i) Oh, how wonderfully vivid! or (ii) What’s the big deal about Toulouse-Lautrec again? If you skip over (i) and (ii) and instead immediately sit down to create a story of heartbreak, loss, and betrayal starring a Parisian dancer, that’s a sign you’re a terrific writer. The music shifts and we set our hands on each other’s shoulders, taking turns leading each other across the planks. Skirts whoosh and rustle, rimmed with lace and red. Men swoon at the sight of our white ankles, but I want more than flesh from you. I want the spice of your breath and the tension of your fingertips and the flint in your ruthless eyes. The more of Rachel Swirsky's work I read, the more I want to read. The Black Pirate (1926) is an early Technicolor silent movie starring Douglas Fairbanks. In its day, it was a major studio production using a cutting-edge, still experimental technology. The imperfect two-color Technicolor process used predated the much superior three-color process. The Black Pirate is an adventure movie. Even though it has sword fights, action sequences, and several explosions, the pacing may be somewhat slow for modern audiences. The movie stars Douglas Fairbanks, Billie Dove, Donald Crisp, and Sam De Grasse, and large cast of extras as motley-looking pirates. The Black Pirate was based on a story written by and was produced by Douglas Fairbanks. Running time is 90 minutes. Pirates take a ship, loot it, and blow up the ship. The lone survivor, Fairbanks, vows revenge. The pirates hide their treasure on the island Fairbanks is marooned on. Fairbanks offers to join the pirates and kills the Captain in a sword fight. To prove himself to the remaining pirates, Fairbanks, now The Black Pirate, boasts that he'll take the next ship single-handed. On the merchant ship that he takes, there is a beautiful princess (Billie Dove). Fairbanks convinces the pirates to send the merchants back, minus their loot, with a ransom note for the Princess. He also secretly asks the merchants to get help from the Governor. The pirate Lieutenant (Sam De Grasse) is annoyed at Fairbanks usurping his leadership position, changing their pirating routine, and for not allowing him ravish the Princess. The Lieutenant arranges it so that the merchant ship never delivers its message. Fairbanks is caught trying to sneak the Princess off the ship and is forced to walk the plank. But ever resourceful Fairbanks swims to land, gallops off on a stolen horse, and brings reinforcements back to rescue the Princess before ransom deadline. Meanwhile old pirate and comic relief (Donald Crisp) defends the princess from the Lieutenant. The Black Pirate and the Princess fall in love, and Fairbanks' Black Pirate isn't a pirate at all. Action scenes in The Black Pirate were staged well. Fairbanks cutting the sails was memorably done. I liked how Sam De Grasse played the evil lieutenant in an understated manner, unlike the melodrama of many silent films. Donald Crisp was funny propping himself up with swords and daggers to stay awake. The pirate costumes of the crew and of De Grasse (long blue coat) and Crisp (old one-armed man) were quite good. In contrast, I found Fairbanks' costume of a black low-cut shirt and black shorts anachronistic and frankly ridiculous. But the award for the most ludicrous part goes to the boat Fairbanks arrives on to rescue the Princess, which looks like a cross between a Roman galley and racing scull. The rowers from the boat are wearing what looks like bandoleers and black bicycle shorts, but at least they are clean-cut, unlike the dirty pirates whom they defeat. This week's story recommendation goes to "Changing Woman" by Brandi Wells, from Issue #Y'aing'ngah of Bust Down the Door and Eat All the Chickens, a bizarro magazine. Bizarro is a surreal and punkish subgenre that can be a lot of fun when you're in the mood for something different. It is deliberately outrageous, with titles like Rampaging Fuckers of Everything on the Crazy Shitting Planet of the Vomit Atmosphere (by Mykle Hansen) or cover images such a woman's naked derrière (Satan Burger by Carlton Mellick III). The best bizarro works are not merely absurd, but manage to employ their strangeness to make interesting suggestions about the real world. "Changing Woman" is that kind of bizarro story, where lots of amusingly odd stuff happens, but there is an edge to all the weirdness. When the title character's eyes slide down her face leaving a huge forehead, it is uncomfortably telling that the husband finds he prefers "the concrete assuredness and structure" of her smooth face, that he starts to wonder if he couldn't fold her whole body into a featureless box. This is a funny and offbeat yet simultaneously disturbing story, a wacky bizarro tale that is also an effective feminist parable. Brandi Wells is just starting on an MFA, but she has already put out plenty of good work, most of it flash fiction, much of it not fantastic, and quite a bit of it in the form of lists don't ask me why. She has popped up at McSweeney's, Improbable Object, Apt, Hobart, and other places, with hopefully a great deal more to come.